Thank you, first of all, dear readers, for bearing with me as I’m still running a day behind on my posts. I’m working furiously trying to get everything done, and it never seems there’s enough time to do it all! The focus for this week is on Spanish breads, a land of well over 300 distinct types, according to a 1999 study. The Spanish eat a truly staggering amount of bread, going through a loaf a day for a small household – or even for one person. There’s a little turn of phrase that adequately and laconically sums up the national attitude towards bread: If there isn’t bread, it isn’t a meal. So why in God’s Green Earth is it so difficult to find recipes for specifically Spanish breads? I didn’t have such problems finding African or East Asian breads, places where they hardly grow any wheat at all. I did manage to track down one website full of Spanish bread recipes, but it was all scaled for professional bakeries, calling for things like 5.000 grams of flour, and my high school Spanish classes did not sufficiently prepare me to translate elaborate recipes over a decade later. Adding to the difficulty, many Spanish breads are quite similar in name and in makeup to other more familiar breads from nearby countries. Spain’s chapata, for example, is a dead ringer for Italy’s ciabatta; and what is a barra if not a slightly harder baguette? There’s not much point in my posting a recipe that differs only in nomenclature from a previous post. Despite my travails, I persevered, and have managed to unearth six recipes that could hardly be more Spanish. Today’s bread, torta de aceite [TOR-tah day ah-SAY-tay], has gained a considerable following of devoted fans, with a notable recent mention in Gourmet Magazine. The word “torta” in the name doesn’t mean “cake” (which is “tarta” in Spain), but rather refers to any round, flat food, usually bready in nature. So the name roughly translates to “olive oil flatbread”, but that hardly begins to describe it. 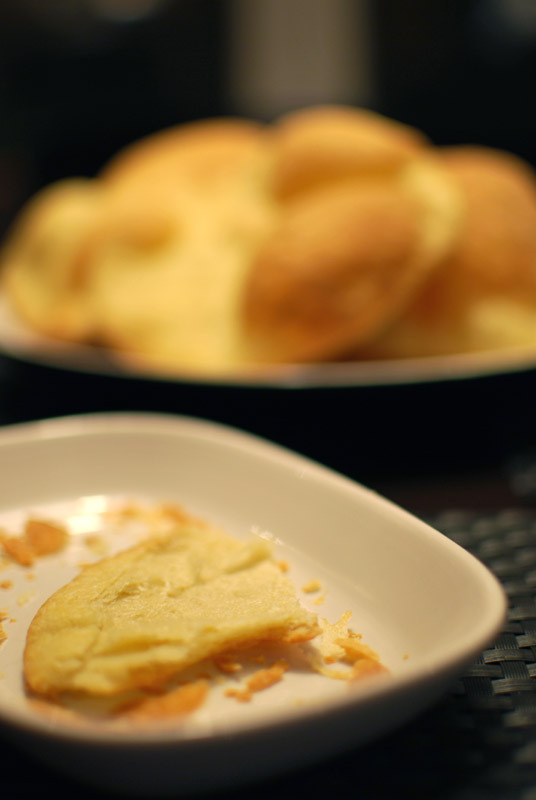 Tortas de aceite are a light and crisp, though relatively thick cracker, about the size of a small plate. As the name implies, they are redolent with fruity olive oil, one of Spain’s culinary crown jewels. Flavored intriguingly with anise and lightly sweetened, this Andalucian specialty certainly takes cues from the sweet-savory cuisine of nearby Morocco, just across the Strait of Gibraltar. The liberal amount of olive oil in this dough not only lends a fresh and seductive greenness, but also makes the finished cracker flake a bit, rather than crumble. They can be topped with a sprinkling of sugar, with crushed almonds, or simply left plain, for a more savory variety. Here, I’ve left them plain, to really let the savory side shine. And if, like a few people I know, you’re not fond of a licorice anise flavor, don’t worry one bit about it. It’s present, but not in the usual brash manner; it’s very subdued, and gorgeously balanced. I managed, as I usually do with flatbreads, to roll these too thinly. My crackers therefore puffed up hugely like pita bread, but never deflated again, balloons that punctured seemingly with even a sideways glance. They were crisp but yielding, sweet yet savory, and wholly irresistible. Rolled thicker, they must have been unbelievably good, especially served with cheese, tapenade, or fresh fruit, as suggested by several retailers of the snack. Because I’m a perfectionist, and because these were so incredibly tasty, I want to have another go at these. This recipe makes 6 tortas de aceite, a pitiably small yield. I’ve seen that versions of these are grilled or broiled instead of (or in conjunction with) baking; the promise of a little smoky char to caramelize the sweet anise flavor is almost too much to resist. Be on the lookout for another attempt, and thank you again for your patience with me! 1. In a small saucepan, heat the olive oil with the lemon peel and star anise over medium heat for 3 to 5 minutes, or until warm. Remove from heat, and let steep until cool. 2. 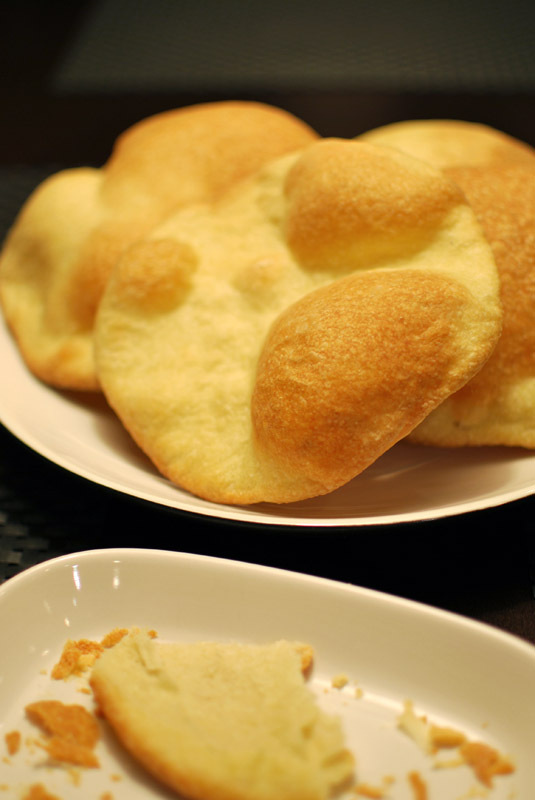 Whisk together the flour, yeast, sugar, and salt in a medium bowl. Add the water and liqueur. Strain the olive oil into the mixture, discarding the lemon peel and star anise. Mix together until a rough dough forms, then knead on a work surface until smooth, about 3 minutes, dusting with flour as needed to prevent sticking. 3. Return to the bowl, cover tightly with plastic wrap, and let rise at room temperature until doubled, about 1 to 1½ hours. Thirty minutes before baking, preheat the oven to 325º F.
4. Turn the dough out onto a work surface, and knead a few times until deflated and smooth. Divide into 6 even pieces. Keeping the unused pieces covered, roll each into a round ball. Cover and let rest 5 minutes. Lightly grease a large baking sheet, or line with parchment paper. 5. On a lightly-dusted surface, roll each ball out into a round disc, about 5 to 6 inches across, or about 1/4 inch thick. Transfer to the prepared baking sheet. 6. Bake the tortas at 325º F for 10 to 15 minutes, or until golden brown. Transfer to a wire rack to cool. Serve warm, at once, or at room temperature. 1. If you prefer a sweeter version, you can sprinkle the rolled-out rounds with a bit of sugar (of any sort) before baking. I bought these tortas in Whole Foods and almost swooned (in Spanish, of course!) from the deliciousness. Thank you for this recipe because I never thought I’d be able to find out how to make these. I’ll be trying your recipe in the next day or two. And thanks again! Now I’m going to check out your other recipes and books. i’m just cooking them now and they smell awesome.